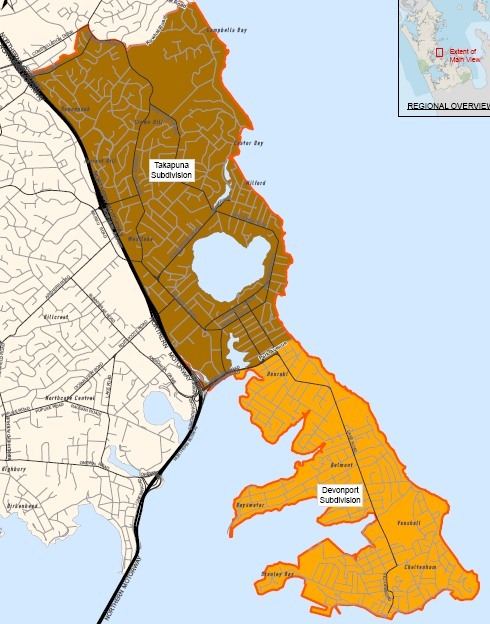 This map shows the North Shore Ward of the proposed Auckland Council. 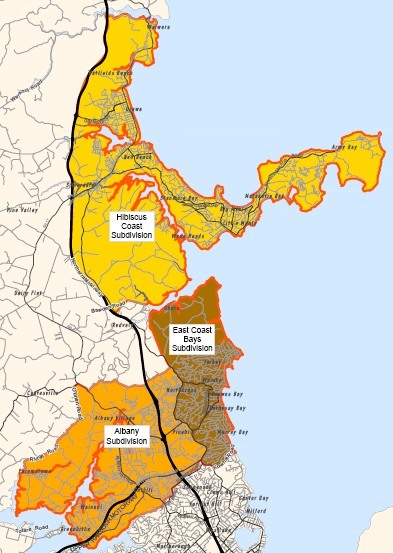 It extends from Campbells Bay in the North, to Devonport in the South, across to Northcote, and up to Beachhaven. It will have two councillors elected at large across the ward. Thus voters will cast two votes, for their preferred two Auckland Councillors. It will have two Local Boards - maps shown further below. 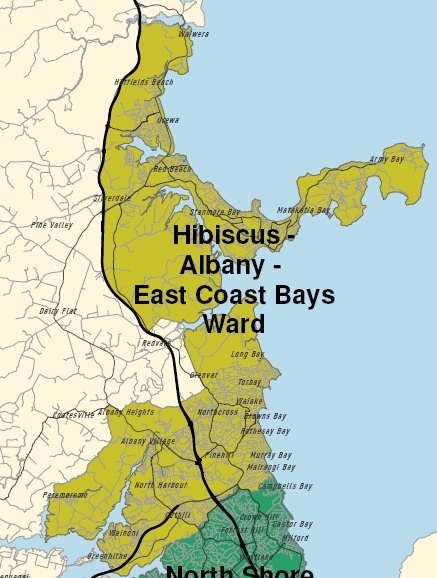 This map shows the Hibiscus-Albany-East Coast Bays Ward of Auckland council. (By the way - the LGC expects submissions about names. What should this Ward be named?) 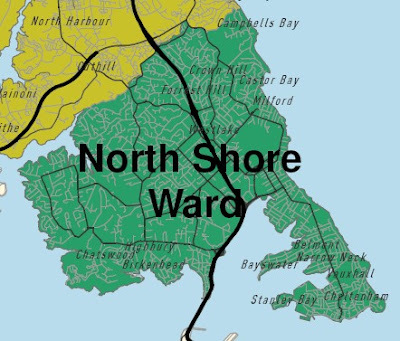 This ward will have 2 Auckland Councillors elected at large from across the Ward. Voters will have two votes to cast for their ward councillors. This ward extends from Wairewa in the the north, to Mairangi Bay in the south. It includes Paremoremo and Greenhithe. It will have just one Local Board. Map below. This map shows the Glenfield/Birkenhead Local Board, which is contained in the North Shore Ward of Auckland City Council. This Local Board is divided into 2 subdivisions: The Glenfield subdivision will be represented by 3 members on that Local Board, while the Birkenhead subdivision will also be represented by 3 members on that Local Board. Giving a total of 6 members. This map shows the Hibiscus/Albany/ECB Local Board, which is contained in the Hibiscus/Albany/East Coast Bays Ward of Auckland City Council. This Local Board is divided into 3 subdivisions: The Hibiscus subdivision will be represented by 3 members on that Local Board, and the Albany subdivision will also be represented by 3 members on that Local Board, and the East Coast Bays subdivision will also be represented by 3 members on that Local Board. Giving a total of 9 members. Sue Piper, Chair of the LGC, emphasised at the beginning that Auckland Council, plus the Local Boards, would be involved in: "shared decision-making". And that set the scene. We also heard from Grant Kirby and Gwen Bull - the other two commissioners. I argued there in support of Multi-Member Wards for Auckland City (ie not single member wards), and also in support of fewer and larger Local Boards - with no more than 3 for the present area of North Shore City. The LGC recommendations are along these lines, and so I am relieved. I know that not everybody agrees with this approach, but in my view, provided Local Boards are delegated significant local responsibilities, duties, roles, powers, and commensurate funding tools - then the shared decision-making structure recommended by the LGC will make the best of the severe re-structuring of Auckland local government. Rodney and Franklin, we have proposed two-member wards in most cases. who to approach with local concerns following the election. our objective to establish an enduring representation structure. councillors could be seen as that much more remote from local communities. reasons, decisions should be made by the Auckland Council. ability to generate sufficient resources to undertake effective local-decisionmaking. contain sufficient capacity to support decision-making on such local services. include establishing processes and mechanisms for community engagement. You can see more in the very readable LGC report, accessible at the link above. Submissions are due by 11th December. These will be considered by the LGC, and their final determination must be completed by 1st March 2010. The draft contains "the top three tiers" of the Auckland Transport Agency. Looking at this structure plan, with all of the boxes and all of the activities, I was reminded of a typical Council Traffic Engineering Department. It's mainly about roads: planning new roads, project specs for new roads, planning options for new roads, assessing new road options, designing new roads. And of course I appreciate and understand that roads are part of the transport system. However, in established and built up cities, new road projects are thin on the ground. Because there's no land left for more roads. Instead emphasis is on re-allocating space on existing road reserves, providing much better share and quality for pedestrians and cyclists, and very much improving the look and feel of road edges, so that local economic development and economic activity is stimulated and thrives and flourishes. Auckland needs to move to that way of thinking if it is to ever climb out of its current sprawling, energy and transport time wasting habits. And it needs institutions that reflect that need. ARTA - what we have now - does reflect that need. Its emphasis is travel demand management. Its driver is a Regional Land Transport Strategy which - while recognising the role that roads play in transport - calls for the delivery of multiple objectives and co-benefits. There is very little balance in this proposed Auckland Transport Agency structure. It reflects colonial times - roads, roads roads - and roading infrastructure construction priorities. The second thought that strikes me is driven by one of the "guiding principles" that apparently have guided this draft structure. It goes like this: "The Auckland Transport Agency will be the subject of legislation which will set out its accountabilities and reporting relationships with Auckland Council as a council-controlled organisation (CCO)....."
So. The Government has yet to show its hand in respect of how the Auckland Transport Agency will be governed, and also who will govern it. As a systematic sort of person, I go with the general idea that form follows function. That means when you design something, you first of all figure out what you want it to do. That would be a reasonable guiding principle. Planning matters. And so does the governance of planning. It includes strategic planning. It includes funding. It links with important tools such as developer levies - both at regional and local levels. And it very strongly links with regional land use planning. A great deal of careful thought was put into these governance and accountability matters when ARTA was established a few years ago. And while there may have been complaints, the model has worked well for the Auckland region. ATA's proposals for the Auckland Transport Agency look very like Watercare. This organisation has operated independently for almost a decade, largely free of public scrutiny, implementing strategic infrastructure, its pumps one of the biggest consumers of Auckland electrical energy. And while Watercare has successfully built a number of large scale projects, it is way behind the eight-ball when it comes to best practice for water and wastewater. Auckland's trade waste record is abysmal. The fact Watercare is determined to dump biosolids in Puketutu reflects badly on Auckland's reputation. The fact Watercare obstructs initiatives to enable non-potable reuse of significant amounts of highly treated wastewater is another example. Watercare may be viewed as a success by some. It has been a successful business. It has supported a substantial water and wastewater infrastructure industry sector. But it represents old thinking, and it resists efforts to achieve the broader co-benefits that arise from integrated planning. It is driven by supply management objectives - not demand management objectives. That is a major risk of the proposed Auckland Transport Agency CCO also. As a contender for role of SuperCity Councillor, I view with growing concern the ability of the SuperCity to shape the future of Auckland through the tiny lever of Annual Statements of Intent of a plethora of powerful, independent, narrowly focussed CCOs. I was Chair of ARC's Transport Committee in 2007 when the ARC voted in support of the Helensville Rail Service trial. At the time I opposed the trial, based on advice received from ARTA and from Connex - the precursor of Veolia. The decision to support the Helensville trial service was made by ARC politicians in the absence of a comprehensive officer report. The advice from ARTA and Connex was predominantly to the effect that regional financial resources were tight, that rail public tranport services are expensive (on a per kilometre basis), and that emphasis must be placed on maintaining and building high patronage core services. I can't recall the exact numbers, but the CEO of Connex advised me that extending the rail service to Helensville was equivalent to extending the length of Auckland's passenger rail line services by about 30% - with all of the attendant servicing costs - but without the justification of significant patronage. I well remember the CEO saying to me at the time, "it would be cheaper to buy each Helensville rail commuter a BMW". Perth has extended the periphery of its passenger rail services to areas of very high growth. And while Helensville and Huapai and Waimauku will grow, growth is slow in sheer population terms, and competing bus services offer a better service than rail in terms of trip times and frequency. I appreciate the argument that growth could be shaped by the provision of good rails services also. However we need to be mindful of priorities for the money we have. The figures provided to the ARC yesterday about the performance of the Helensville trial spoke for themselves. 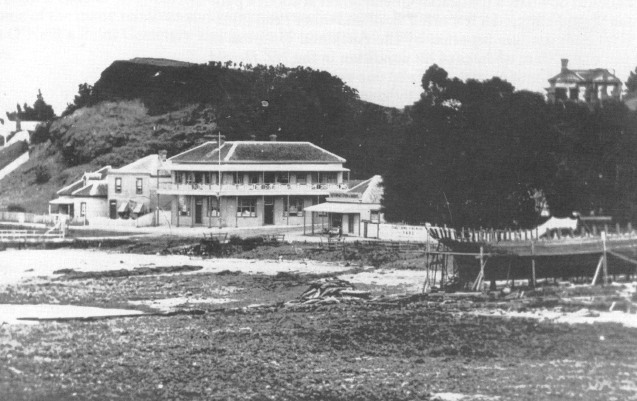 The Helensville Trial Service comprised one morning and one evening service to Britomart. The trip time was between 93 and 98 minutes. Bus journeys are quicker. For example the 6:34am Helensville to Britomart bus arrives at 7:50am, 17 minutes before the 6:32am Helensville to Britomart rail service. On average 14 passengers took each train to/from Helensville. That equated to a subsidy of $45.72/passenger for each trip @ 99 cents/kilometre. Thus the subsidy for a commuter round trip to Britomart was $90. For a commuter using the train for a year - 200 working days - this equates to an annual subsidy of $18,000/Helensville-CBD commuter. And overall this equates to $250,000 annual subsidy for 14 people - a high price to get 14 cars off the road. Maybe the Connex CEO's prediction was understated. The figures provided in the ARC report do not include the cost of line access. This is the fee charged by Ontrack/Kiwirail, to generate the revenues they are reliant upon to carry out track maintenance. At the meeting a figure of $1.5 million was mentioned as the annual track access fee that would normally be payable for the 30km or so of additional track that is involved with the Helensville service. Apparently Ontrack agreed to waive the fee for the period of the trial. So. The trial is over. Some investment - $1.25 million - was spent to upgrade station infrastructure and basic amenity. That investment should be protected for the future. And we all learned something. It is a good idea to connect growth areas with good public transport services, to prevent motorcar dominance. But that idea's time, has not yet come to Helensville. The commentators have used up all the words for the Queens Wharf Design Competition: farce, mockery, joke, sow's ear.... Senior officials have mentioned the sheer number fo design competitions that have been had, but not built. Something's wrong in the state of Auckland. I think we are trying to wrestle our city out of a state of urban barbarianism. This barbarianism shines out for all to see when elected leaders make pronouncements about "wow factors", "iconic buildings" and Auckland being "world-class". Some Herald writers are just as bad. In Auckland, mayors, chairs and leader writers are not where they are because they are fantastic designers, or great urban designers, or even architects. Most of them would say to this, "yeah, but I know what I like, and I don't like that..."
Some cities do things differently, and I guess we can learn from them, but more likely we'll just learn from our mistakes. I just hope we don't make too many more. At least Queens Wharf is on the back-burner. Wanton and hurried destruction followed by hasty construction won't happen. All this process took a couple of decades. The results are excellent. Auckland has a lot of design and planning talent. You see them employed privately and in consultancies and agencies. A good number are also employed in Auckland local government. 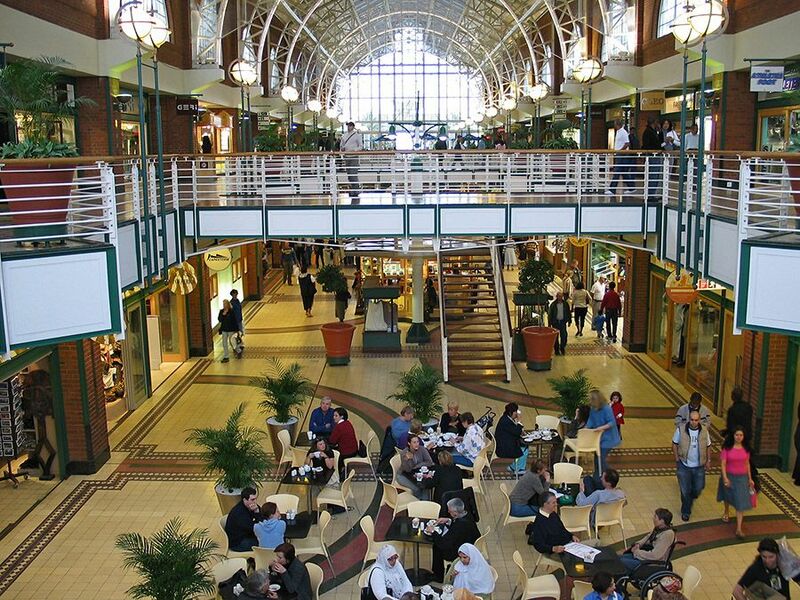 Many from the private sector got involved in the Queens Wharf design competition. Many did not because they felt the design brief was flawed (Cruise ship terminal would compromise Queens Wharf, inadequate budget, insufficient design time etc....). And some were included in the Design Panel, where they provided professional advice about the entries. Advice to Auckland Leaders and Ministers Gerry Brownlee and Murray McCully. I get the impression their advice was ignored. The "we know best" approach won the day. Getting the best out of Queens Wharf and Auckland's waterfront should not be about Cruise Ships and iconic buildings. Nor should it be about one politician's idea of WOW. I think Auckland people have been short-changed on their waterfront for decades. That is the need that should be addressed, and that is why I see the need for Urban Design and Urban Planning down there, long before I see the need for Architectural Designs. 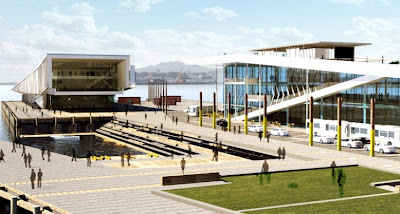 In the past decade there have been two responsible initiatives at Auckland's waterfront. 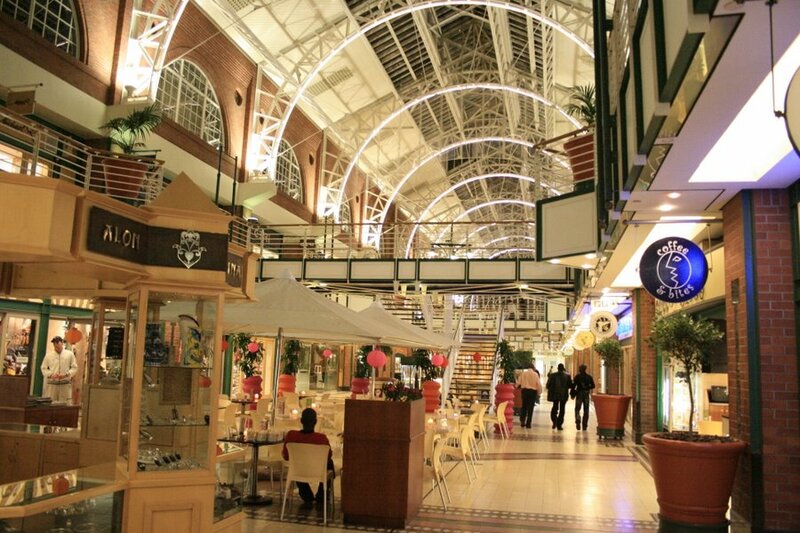 The first was Britomart - in the time of Mayor Fletcher. That project was a success - sure Queen Elizbeth Square could be improved and it still can be - but the overall result (including Takutai Square behind the railstation), the retention of heritage buildings, and the station restoration itself is outstanding. The other project - in the time of Mayor Hubbard - was a visionary look Quay Street and the whole waterfront from Ferguson through to Westhaven. Didn't go anywhere fast, because ARC had not been involved in that visionary look and was concerned to protect the viability of Ports of Auckland. And there's the rub. Ports of Auckland, and its viability, its appetite for wharf space and container space and cruise ship space, continues to be the tail that wags the dog of Auckland's waterfront. Perhaps SuperCity will keep it chained, and allow some sort of design renaissance to flourish in Auckland, beginning with Queens Wharf and Quay Street. There's wisdom in the more considered remarks of Hamish Keith in today's NZ Herald, and also in the letter there by Architect and ideas man Stephen Smythe. Their advice calls to mind a wise comment made to me by an experienced former councillor. He said, "a good day in council is one where a bad decision was not made..."
The Queens Wharf design brief was a bad decision because ARC wanted to turn Queens Wharf into Auckland's primary Cruise Ship Terminal - with Cruise Ships allowed on both sides. That's what killed the plan to have a great public space there. ARC's plan - led by its Chair - should have been put out for public consultation, along with other broad ideas for the use of Queens Wharf - like emphasising its public purpose and ferry use and using its heritage buildings for other purposes - long before Auckland's design community was put to work designing a dog of a design. Trying to make a silk purse out of a dog's ear. Government's idea of Party Central was always a good simple idea, because all it called for was some temporary renovation and structures. Put them up in time for the Rugby Event and take them down afterward. Use the time as an opportunity to experiment with ideas - as I wrote in the Herald months ago. I have always wanted to see much more effort put into fixing the Cruise Ship terminal on Princes Wharf. Making it work better than it does now. 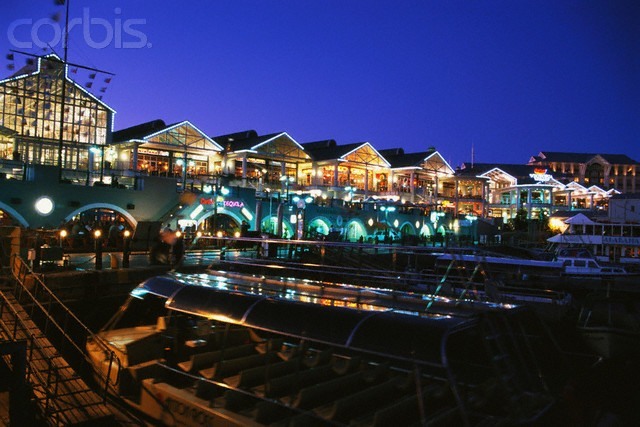 I've seen reports which indicate that the Cruise Ship industry is not unhappy with Princes Wharf. Sure they'd like it to be better, and two terminals are always better than one, but hey - we only have a couple of these big wharves downtown. In my opinion the Cruise Ship industry can have access to one of these - but we'll have the other one thank you very much. 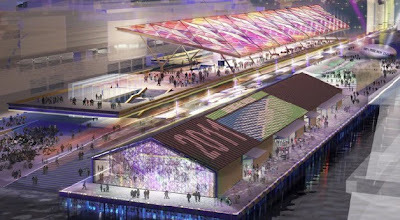 If there must be another cruise ship terminal, then allocate wharf space further east. Learn - again - from where Wellington is locating its new cruise ship terminal. My objective through this whole sorry process is to ensure that the existing sheds are not lost and denigrated in a fervour of Iconic Cruise Ship terminalitis. It has been disappointing to see politicians normally keen to save wooden hospital buildings and historic railway station buildings - all dilapidated and crumbly before careful conservation - jump so quickly to disparage and demolish Queens Wharf's extraordinary sheds. The Heritage Assessments I have read - which have yet to be shared with the public - indicate these are treasures of national importance. Martin notes further: “The sheds are the last link to a waterfront history that shaped Auckland, but which has all but disappeared.... Cities overseas have shown what buildings like these can become with a little creativity and investment. In the right hands, the Queen’s Wharf sheds could become some of the waterfront’s most prized assets,” he says. Show some leadership guys. Do the right thing. The tyranny of the majority (or do I really mean: of the uninformed) threatens what has been an action packed and highly participated and idea-filled design competition. Sure the brief is tight: short-term party central, longer term legacy opportunity, keep the sheds vs demolish the sheds, cruise ship terminal, $47 million. But actually: money is tight, time is tight, and there's lot that's mighty fine about the ideas that have been put up. I've selected a few images here from among finalist designs. They are beautifully executed, and show real care for the purpose: people space, gathering space, Auckland. Put yourself in these pictures. They are not oil paintings - to be looked at from a distance. They are places for people to go and see and enjoy themselves. Take a look at them. Go down to Quay Street and understand them. And don't be put off by the baying of politicians. 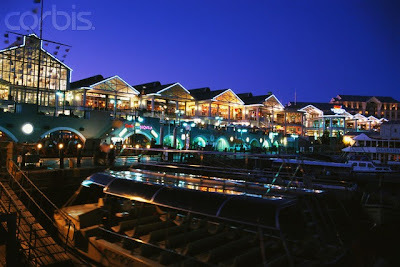 They are places for Auckland local people to go, and see, and enjoy themselves. "...Another dog is sick after a beach walk, this time north of Mathesons Bay at Leigh. Tetrodotoxin, found in a number of poisoned dogs at Hauraki Gulf beaches since July, is suspected but tests have not yet been done to confirm the poison because of funding issues. Experts say the latest poisoning is an indication the problem may have spread beyond inner city beaches, with most cases at Narrow Neck Beach on the North Shore. Warkworth veterinarian Roger Dunn confirms a distressed client brought her dog to the surgery on Labour Day when it began vomiting within about 30 seconds of licking what the owner thought was a decaying jellyfish near Daniels Reef. Dr Dunn says MAF Biosecurity has indicated from the symptoms that tetrodotoxin poisoning was the likely cause. A number of dog poisonings have been linked to tetrodotoxin or TTX, found in the grey side-gilled sea slug, but suspicions in this case fall on the slug’s jelly egg strand, often attached to rocks or floating freely. "While the worst effects were starting to wear off, the dog was still shaking and had to be carried into the surgery," Dr Dunn says. "It had been vomiting for some time in the owner’s car. "We gave the dog an anti-vomiting injection and would have put in a drip and given other treatment if needed." The woman owner, who doesn’t wish to be identified, told the Rodney Times she was walking with her two dogs over rocks with many rock pools exposed as the tide was out. Aware of the dog poisonings attributed to tetrodotoxin, she says she had been particularly vigilant watching her dogs. What "looked like a decaying jellyfish" was in a crevice. One of the dogs, "Charlie", licked it once while being called away. Within 30 seconds Charlie started heaving and was vomiting violently and shaking, the owner says. It took 10 minutes to get the 40kg dog to the car because she was continually vomiting and convulsing. "I’ve never seen such a violent reaction. I’ve had a dog die before from eating poison and this was nothing like that," she says. "With it being the holidays there was a lot of traffic on the road and I got stuck in traffic. Some people were very kind as they could see I was crying, even so it still took 40 minutes to get to the vets in Warkworth." Dr Dunn says a smaller dog would have died. "This is a large, strong, young dog and she received a sub-lethal dose of a toxin," he says. "If she had been a small 6kg dog she would have died." Paul McNabb from the Cawthron Institute in Nelson, the independent trust that has been testing for the poison, says the last confirmed dog death from TTX poisoning was at Tapu Beach in the Coromandel in late September. Vet Elsa Flint from Shore Vets in Devonport, whose clinic dealt with one of the dogs that died and another confirmed poisoning, says there were two confirmed poisonings on Takapuna Beach about a month ago. Dr Flint says the public needs to be more vigilant about TTX poisoning from sea creatures, instead of focusing on the rat poison brodifacoum. "The symptoms of TTX are completely different from poisoning from the rat poison brodificoum," she says. "Brodifacoum isn’t fast-acting and doesn’t cause vomiting. Rather it works on the clotting mechanisms in the blood and can take up to three or four days to kill an animal, with the animals dying from internal bleeding. They also have an excessive thirst. There is a totally different presentation." Dr Dunn agrees. "I have seen many cases of brodifacoum poisoning in my career as a vet and Charlie’s reaction was completely different. She reacted to an acute toxin." Charlie the dog has since recovered. Useful contribution to the disucussion. ARC’s Chairman Mike Lee has every right to express his opinion that the Queens Wharf design competition is a flop and that the hundred year old sheds should be demolished. I don’t agree with him and nor does ARC policy. And, so far, the ARC hasn’t agreed to become an advocate for the Society of Iconic Building Architects, nor for the P&O Cruise Ship Company. 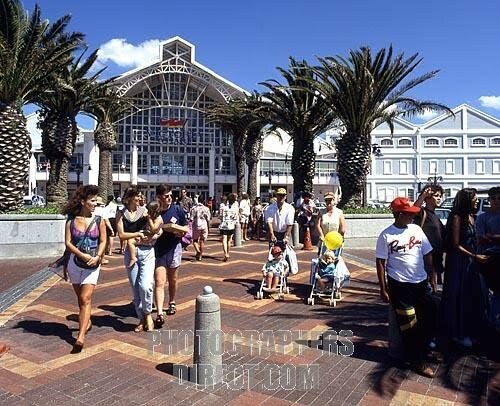 What Auckland needs on its CBD waterfront is a popular people place. Aucklanders need a well designed and active public experience on Queens Wharf, far more than they need iconic buildings and cruise ships. To be successful, Queens Wharf will need structures, but these should primarily serve the public need ahead of shipping profits and design egos. 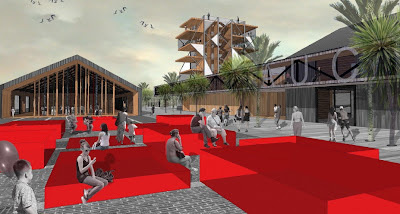 Many of the design competition entries illustrate how the hundred year old bones of Queens Wharf’s sheds can be respected and utilised to spectacular effect. Attractive waterfronts around the world have brilliantly renovated sheds, and we should do a Pacific job on ours. It is time to embrace the ideas of our best designers and get on with the job. This should not be a political football. Q1: When will Auckland Council (AC) - the organisation - actually start? It appears from this document that the new Auckland Council will be up and running well before the election on October 30th 2010. This is probably not a surprise. So. When? Q2: What other CCOs (other than Watercare, Transport Agency, Waterfront Agency), are being proposed? Q3: Where does the policy and management around stormwater go (document is silent)? Q4: What date does ATA think the Auckland Council service delivery restructure - assumed to happen sometime after 1 November - will be completed? Q5: The document states: "...the Auckland Council will not simply replicate the current practices...within existing councils". How does that square with another statement: "...it is likely that .... the Auckland council will rely mainly on current council systems and processes..." ? Q6: What additional CCO's does ATA consider would be appropriate for Auckland, and has it sought a government mandate to implement those new CCO's? Q7: Where is it proposed to relocate the Auckland Transport Agency? Will Watercare remain located where it is? 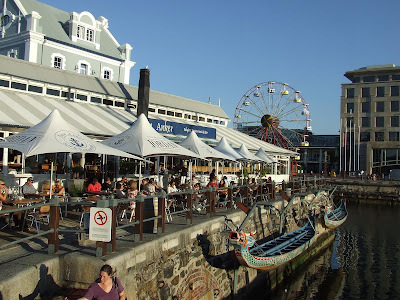 What about the Waterfront Agency? Is ATA interested in ensuring there is good communication and dialogue between Auckland Council and its CCO's, or is it keen to put as much distance - control-wise and every-other-wise - between Auckland Council and the CCO's it is being set up to govern? (1) Interesting that it is proposed that "AC's Interim Chief Executive" will have direct control over: communications; human resources; risk (undefined) and emergency management. These functions will not be reported to a General Manager. The document states: "post-transition it is expected these arrangements would be reviewed..."
(2) Probably the most revealing.... "while preliminary planning is underway, it is likely that upon establishment, the Auckland council will rely mainly on current council systems and processes..." So. The SuperCity restructure is really about governance restructure, and not about service delivery restructure. Thought so. But here it is in writing. (3) The reason or excuse for (2) has already been publicly stated and that is that service delivery should be "seamless after 1 November". Wow. So it's change - but no change... It's change to governance, but no change to service delivery... The document goes on to state: "... service delivery will change following the development and adoption of consistent and integrated service strategy and progressive integration of systems...". All that some time after 1 November 2010. No date given. (4) A bouquet though .... at page 9 and 10 is set out the planning role of Auckland Council in regard to the roles and responsibilities of the Local Boards (or community Councils). How will this work under SuperCity? The structure has a "Manager of Infrastructure and Utilities" under the "Chief Operating Officer", so I guess that's where councillors might get quarterly reports about overflows at North Shore pump stations - from Watercare. I say: might. Then there is the strategy division under the "Chief Planning Officer", who has a "Manager Regional and Local Planning". Nowhere is there a "Manager Water and Wastewater". Either under "Planning" or "Operations". And under "Chief Finance Officer" there is "Manager Local Board Services". Would that person be responsible for ensuring Local Board concerns about regular dry-weather overflows, or wet weather overflows, were dealt with? And - in terms of setting strategic priorities for Watercare in relation to network management - where would that sit in the proposed structure? 5) The Draft Scope of Workforce Change is an interesting section, which deals partly with systems and also with staff. It notes at the outset that: "... the integration of the IT and other systems and processes which support local government activities will take time..." (Probably the understatement of the century that one - and one of the reasons why wholesale abolition was always an irresponsible option), and interestingly that: "...government policy decisions are needed, regarding ATA's mandate in dealing with existing or the creation of new council controlled organisations...". 7) The document indicates that ATA "does not intend generally" to review staff numbers or roles, "...whose jobs are specific to particular operational work in .... social housing; local community development and funding; youth,safety and other community programmes... or in infrastructural services such as stormwater, transport and water services..." It notes though, that: "where this work is located may change..."
8) However the document notes: "staff whose primary functions relate to strategy, policy and planning are likely to be involved in significant change as these functions will generally be centralised..." So that's a change. An expected change. How will this work under SuperCity? A simple change in this term of ARC is illustrative. Last term, the ARC's Transport Policy Committee dealt with ARTA. It did the Statement of Intent, Administrative Budget, Annual Plan and Priorities, and it received the Quarterly and Annual Reports, and it had ARTA into committee when matters of public interest arose. This term it's been different. Why? Because it was decided at start of this term, that Finance Committee would deal with CCOs - SOIs, Reporting, Budgets, Board Appointments etc - and it has led to a disconnection between transport policy and transport delivery. That should be fixed. 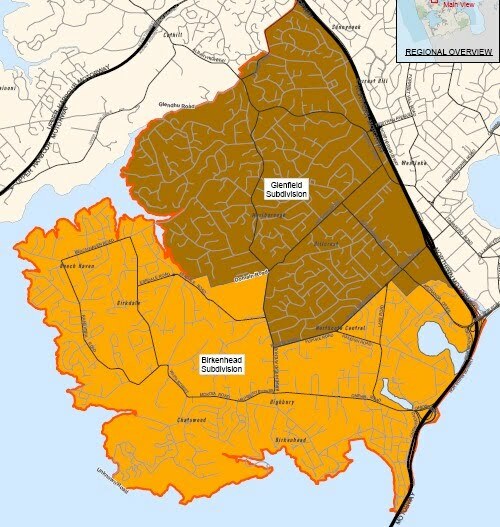 The way I read the proposed structure for Auckland Council, there is separation and disconnection with bells on. For a start there is no Transport Strategy Manager. And, like Scenario 1 above for wastewater, there is poor connection between management of local board services (which I presume must include their concerns - eg about road surfacing, bus shelters, traffic lights.... the list is long), strategic transport planning, and "operations" under that hard-working "Manager Infrastructure and Utilities" - all in different divisions. So come on guys. How about illustrating your structure with a few real scenarios. Convince yourself that it will work with some typical infrastructure plans, priorities, budgets, services, reporting, accountability. Then tell us. 11) This section explains the rather awful, but necessary process of "mapping" where existing employees will be shown a "map" of the new, and the old, with arrows (presumably) showing the route options open to them. Job changes, location changes, criteria for consideration, and then other options for down-sizing staff ranging from: attrition; alternative appointment; voluntary redundancy and compulsory redundancy. At least this part's all pretty clear. So that's my take on what this discussion document tells us. Interesting, but has a bad feeling about it. Lots of unanswered questions. Still feels a bit like a train wreck in slow-motion. Scenario Thought 3: More, or Less, Integrated Planning? One of the main objectives of this whole destructive restructure of Auckland Governance, was to deliver integration. But I fail to see how this can happen in the proposed structure (the diagram), the apparent lack of ability to govern the CCOs, and the suggestions that the CCOs will be located some physical distance from the heart of Auckland Council (Watercare is already separately located, and the document suggests that ARTA should relocate "to make room for" centralised staff). ARC went to considerable lengths to ensure that the core of ARH and ARTA were co-located with ARC's core at Vodafone House. This was not so that Councillors could "meddle", it was to ensure very good communications and contact between left hand and right hand. I am keenly aware that certain interests would LOVE Auckland's water and transport CCOs to be a million miles from their governors, and the key staff who will be responsible for making that governance work. And I know about internet, telephones and email. There is a lack of public accountability and political reality in what increasingly looks like a corporate-designer institution whose bureaucracy and core functions are structurally - by design - separated from Auckland Council and Auckland Councillors. In many ways, walking and cycling are great ways to get around our city. These non-motorised travel methods cause virtually no noise or air pollution. The only energy they require is provided by the traveller, and the very generation of that energy leads to useful cardio-vascular exercise. These modes don’t take up much space either, and they are quite economical, costing much less than cars and public transport, both in direct user costs and public infrastructure costs. In fact the presence of pedestrians and cyclists enhance the liveliness or urban environments, making both commercial and residential areas safer and more interesting. Unfortunately, North Shore City Council, in common with other Auckland Councils has done little to promote walking and cycling – especially safe walking and cycling. On the contrary, many recent transport “improvements” to North Shore City – generally to ease congestion and create more capacity for vehicular traffic - have often made walking and cycling less feasible, less convenient, and more dangerous. The consequence of this is that walking and cycling make up a smaller and smaller proportion of all trips. A research project gave me an opportunity to to recall some of my experience of this. It serves to illustrate the problems that confront those who seek to ensure that the safety of the most vulnerable members of our society are recognised and provided for in all aspect of transport design. Fig. 1 Wolseley Road. South side. Footpath camber safety issue for disability buggies, prams and children on bikes and other toys. Figure 1 shows the footpath on the south side of Wolseley Road, Milford. It was pointed out to me by an elderly resident when I was campaigning for election to North Shore City Council in 1998. After election one of my goals was to change North Shore City council’s footpath policy so that this sort of problem would not be repeated. I also tried to ensure that retrospective repairs were made to pavement where there were similar safety issues. The photograph here was taken in 2007. To date no work has been carried out to remedy this problem. I raised this matter at various Council meetings. 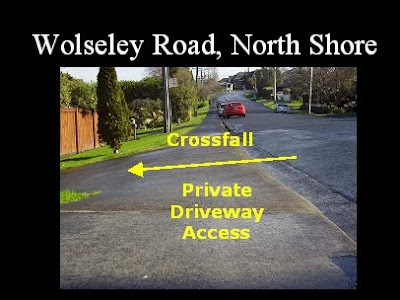 A typical response from some councillors was that people who were worried about falling, or rolling down the driveway (it was a joke for some), should use the other side of the road. Figure 2. shows the other side of the road. Fig 2. Across the road from figure 1, looking East. 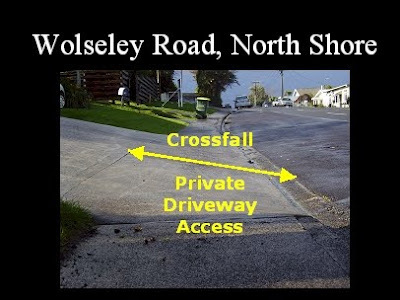 Officers explained to me, and to my fellow councillors – in report after report – that there was an issue with some North Shore roads, because of the steep terrain in some parts of the city, that unless effort was made to smooth the way between the road and the driveway, then cars would bottom and risk damage in making the transition from private property to the roadway. I understood that that was clearly an issue, but it did raise questions about the planning that had gone into the design of this road, and others like it across the East Coast Bays area. The question of who had right of way arose. I asked officers to report to council who had right of way on a footpath: did a car crossing the pavement have right of way, or did a pedestrian (or cyclist) using the pavement have right of way over a car crossing the pavement? When I asked these questions I expected the answer to be straightforward, but it took officers almost two years to provide the answer to the question. It was stated that national transport policy guidelines indicated that pedestrian users had right of way in those circumstances. We were getting somewhere. Fig 3. Looking south along Lake Road near Belmont. The asphalt footpath has been resurfaced, but all of the driveway crossings have been replaced with concrete aprons allowing quick access and egress. 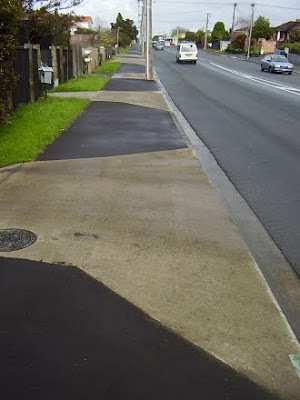 Then in 2002, after programmed maintenance of Lake Road pavements, I was surprised to see Devonport’s traditional asphalt footpaths altered and severed through the construction of concrete accessways, as pictured in Figure 3. These were put in place at the same time as footpath asphalt. When questioned, officers justified their actions by saying it was consistent with council’s “like with like” policy, that when maintenance work was done, like materials would be used when carrying out repair works – it was just that the concrete needed to be strengthened… By now a few more councillors shared my concerns. They could see that what had previously been regarded as a continuous pavement for pedestrians and other users, had been transformed into a dangerous obstacle course cluttered with a series of high speed private entry and egress access “roads”. I raised with officers the question whether constructing a pavement like this was consistent with national policy of ensuring that pavement users had priority over those needing to access the road or private property by driving across the pavement. It was obvious to all that the provision of carefully shaped aprons meant that it was easier for a car to drive into or out of a driveway at speed, putting pedestrians at increased risk. Officers suggested that – at considerable cost – these aprons could be removed. Another option was to cover the concrete with a coating of asphalt, but this would have camouflaged the fact that the surface was now undulating, and might itself contribute to accidents. All very frustrating. Around this time I became aware of the existence of Council engineering design standards. After some cajoling, Council officers were persuaded to put on a Works Committee agenda, a report which contained the particular engineering design standards that had led to the changes in pavement layout in Lake Road. These standards were also responsible for the design outcomes in East Coast Bays Roads like those illustrated in Figures 1 and 2. I moved resolutions which sought changes to these design standards in order to achieve pavement designs which would not discriminate against the safety of pedestrians and other pavement users, through prioritising the safety of cars and car movements. Though I still had a year of my term to run, this resolution did not succeed while I was Chair of the Works Committee. A major success in 2003 was the development of North Shore City’s first Walking School Bus. Council was concerned at the number of car trips involved in taking kids to school. Surveys showed that parents did not want their children walking to school, because they felt it was not safe. Officers came up with the Walking Bus idea. It was supported by Councillors. 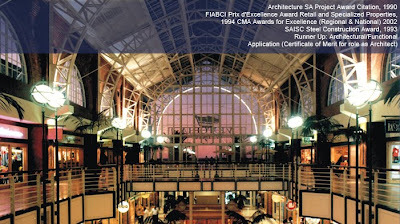 Implementation was funded by Infrastructure Auckland, ARC and North Shore City Council. 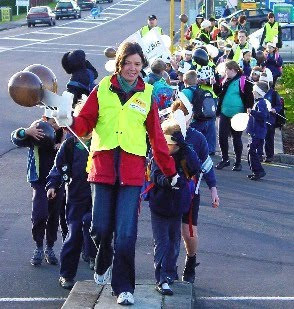 Positive media followed and – when ARTA was set up a year later – Walking School Buses was one of the first Travel Demand Management projects it adopted and pushed throughout the Auckland Region. This was a success story, and one North Shore City Council initiative I felt proud of. Then in 2004 another issue arose in respect of pedestrian safety, particularly the safety of children walking to Westlake Girls High School. Changes were proposed to the road network around that school to accommodate traffic-engineer predictions of increased movements along Wairau Road, and the need to provide for buses accessing the Westlake Busway Station. This involved Shakespeare Road being extended across Wairau Road. Fig 5. Westlake Girls High School is in top left corner of this artist’s impression of the modified Wairau/Shakespeare Road intersection. The brown areas are pedestrian holding bays. Note the large radius turning curves which allow fast travel. Fig 6. Thousands of girls attend the school and need to cross this intersection to do so. It is busy and dangerous.